Arecibo is known as La Villa del Capitán Correa, in memory of a battle fought successfully on its shores by Captain Antonio de los Reyes Correa and a handful of Spanish Army soldiers to repel a British invasion by sea lead by Admiral Whelstone in August 5, 1702. The town is also known as La Muy Leal Villa (very loyal). 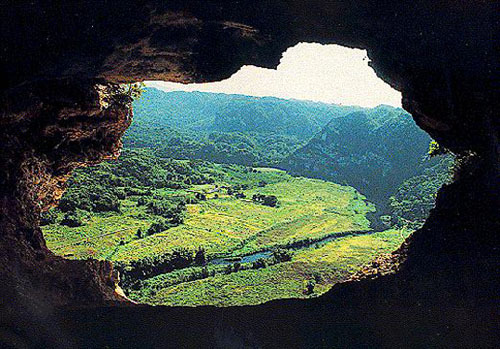 You can visit Cueva del Indio, an archeological site, the cave is located on the shores of the Atlantic Ocean, in Bo. Islote. It it is called The Cave of the Indian, because drawings of the Indians that lived in this area in the Prehistoric Era were found in the walls of the cave. Rt 681 Km 7.8. The town has an official U.S. port entry. 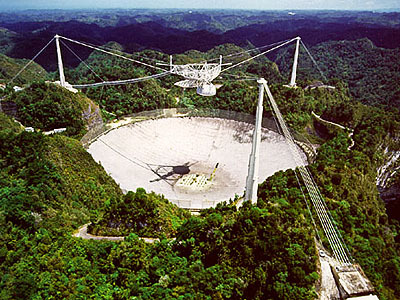 It is also home of the world's largest single-dish radio telescope, located 16 km (10 mi) south of Arecibo. The Arecibo Observatory is an astronomical observatory, which is one of the world's most powerful radar-radio telescopes. This instrument, inaugurated in 1963, employs a 1,000-foot (300 meter) spherical reflector consisting of perforated aluminum panels that focus incoming radio waves on movable antenna structures positions about 500 feet (168 meter) above the reflector surface. The antenna can be moved in any direction, making it possible to track a celestial object in different regions of the sky. It collects radio astronomy, terrestrial aeronomy, and planetary radar data for scientists around the world. The telescope was featured in the movies GoldenEye (1995) and Contact (1997). The National Astronomy and Ionosphere Center developed the observatory and it is operated and owned by Cornell University under a cooperative agreement with the National Science Foundation. Conceived in 1958 by William E. Gordon, a Cornell professor of electrical engineering, the radio observatory has been operated, since its completion in 1963. The Arecibo Observatory is powerful enough to receive signals transmitted by a comparable telescope located 1,000 light-years away. Scientists from all parts of the world come to this national observatory to carry out research projects. Open to the public for self-guided tours. The facilities are open to the public Wednesday-Friday noon-4 p.m., Saturday and Sunday 9am - 4pm. Admission is $12 for adults, $8 for kids and seniors. Route 625, Bo. Esperanza, (787) 878-2612. The Cambalache Forest Reserve located between Arecibo, Manati and Berceloneta, and covers an area of 1000 acres with an elevation raging from 5 to 50 meters above the sea level. IT is known as "vivero" (nursery) because it contains plantations of eucalyptus, teak, and mahoe trees. Camping allowed in two areas. Water and showers, 8 trails and nearby beach. Rd #682 km 6.6.,	(787) 724-3724. The City Hall built in 1866, served as jail to "El Grito de Lares" participants in 1868. In 1918, the frontal section of the building was destroyed by a earth tremor. Repairs were made and a tower and clock were added to the building. In 1978, the building was restored to its original form. The Antonio Nery Juarbe Airport is located five miles southeast of the central business district of Arecibo and 50 miles west of San Juan. Originally utilized for military purposes, today, the airport is utilized for the general aviation, with a daily average of eight takeoffs and landings. On March 31, 1947, the airport and all its installations were transferred by the Navy U.S. to the Authority of the Ports along with the Airport of Mayag�ez and the old airport of Santa Isabel. The Arecibo Lighthouse and Historical Park built by the Spaniards in 1898, the lighthouse still in use and was automated in 1964. In the premises, you'll find a museum with exhibits, a recreation area featuring a special area for children with replicas of ancient sailing ships and a pirate's island, a restaurant and sports facilities. Open Tue-Fri 9am-6pm, Sat-Sun 10am-7pm. Admissions: Adults $9, Children $7 and Parking $2. Carr. #655 Bo. Islote Sector El Muelle, (787) 880-7540. The Dos Bocas Lake is a reservoir created in 1942, adjacent to the Río Abajo Forest, located 12 miles (19km) south of Arecibo. Free ferry ride across the lake are available, (787) 878-7279. La Casa Ulanga Sede del Instituto de Cultura Puertorriqueña - Open Mon-Fri 8am-noon, 1pm-4:30pm. 7 Gonzalo Marin St., (787) 880-8020. Museo de Arte e Historia de Arecibo - 8 Santiago Iglesias St.
Arecibo produces agricultural machinery, clothing, plastics, paper and sporting goods. 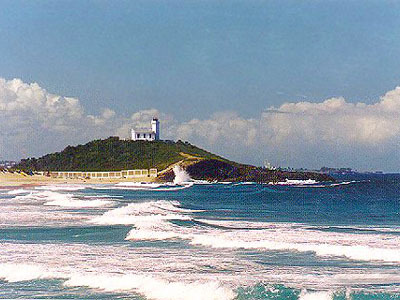 Arecibo is the largest city in geographical size on the island. Located in the Northern Coastal Valley region, adjacent to karst zone characterized by the presence of caves and wooded hills. Arecibo is bordering the Atlantic Ocean, north of Utuado and Lares; east of Hatillo; and west of Barceloneta and Florida. The city is bathed by two rivers, Grande de Arecibo, which runs through the middle of the city and the Tanamá River. Arecibo annual precipitation is around 53.01 inches and the average temperature is 77.8°F. June is the warmest, February is the coolest, and May is the wettest month. Want to know what to see and do in Arecibo? Discover few ideas for exploring and enjoying the city. It's held in the Arecibo central plaza, where salsa groups and other groups mingle. The festival it's a tribute to fishermen. The flag of Arecibo derives its composition and colors from the Shield of the City. It is divided vertically in two equal parts. The left side is blue having a belt that stands for "Captain Correa", a local military hero from Spanish times. The right side is made up of blue and yellow diamonds alternating in a checkerboard pattern. The shield is divided by diagonal lines in golden and blue rhombuses with a blue stripe in the superior part, in which resides an opened five-point crown and which is adorned with drawings characterizing the art of the Ta�nos. This combination of symbols represents the Indian Cacique (Chieftain) from whom the population's name derives, the governor that erected the town and the hero Captain Correa who defended it.